As a business in need of LCVs, you’ve probably been surprised by the sheer number of providers out there — not to mention the many different hire packages they offer. 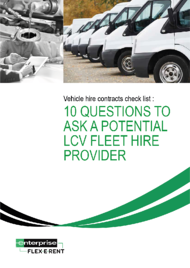 It’s vital to consider your options thoroughly before committing to a commercial vehicle hire package. Making a hasty choice can cost more than you anticipated, result in excessive downtime and land you with unwanted admin. Making an informed decision will keep your vehicles on the road and your business running smoothly. Download this guide to arm yourself with the questions you need to ask to find out whether a leasing plan is as good as it seems.